A feminist space western? I can safely say I have never read a book like K.A. 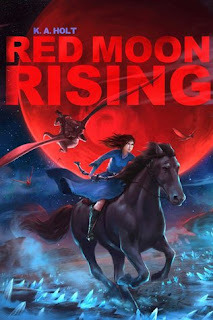 Holt's Red Moon Rising, which is too bad because it is totally unique. Our heroine is Rae Darling, the descendent of space farmers, who lives in constant fear of being abducted by the Cheese, natives of the moon who ride dactyls and cut off ears. Unfortunately, she and her sister are taken, but what they find surprises them. Among the Cheese, females are valued and trained to be warriors. Rae's sister quickly adapts (too quickly to be believable), but Rae struggles to decide where she truly belongs. While there were a few things that could use some explanation (Horses in space? How do people breathe? ), I enjoyed most of the world-building in the novel. Best of all was the Cheese language, which seems incomprehensible at first, but slowly becomes a good portion of the dialogue. Without translation, the reader understands it. I love how Holt did this. We'll be reading Stuart Gibbs' Space Case as our science fiction novel, but for my advanced readers who have already breezed through all of Gibbs' novels, I'll be recommending Red Moon Rising. It's too good not to.